Once you have added your Site Information, the next thing to do is to add some of the Pages that you want eg Home Page, Contact Us, About Prostate Cancer. When you select the Pages tab and then the Add New tab, you will be presented with the screen below. There is an explanation of each numbered section beneath it. Pages are displayed as tabs if they are top-level pages but as sub-pages if they are added beneath a top-level page. So, the About Prostate Cancer tab might have Treatment Options, Side Effects and Links to Other Cancer Sites as sub-pages. 1. These tabs let you Add, Edit or Change the Order of the Pages. The screen displayed is the Add a new page one. 2. The Name of the page eg Home or Contact Us. It is important to remember that once you have created a name, whilst it's possible to change it, any links to that page - not only on your site but also other sites - will no longer work. You can of course change your own links but not other websites. So it's worth getting the name right to start off with. Basic Content the most common type which gives you a blank canvas on which to work. Calendar useful for listing all your forthcoming events including such details as Event Name, Start and End Date and Time, Location, Map Reference and some free text about the event. Contact useful for listing, for example, your committee members with their Name, Role, Telephone Number, Email Address, Picture and some free text about them. Gallery To display pictures eg of fundraising events with free text to describe them. News Useful for reporting news about your group eg the report of your AGM, how successful a particular fundraising event was. Keep your members up to date with what your group have been doing. Or what Tackle has been doing! 4. This shows whether the page can be seen by people browsing your site (Enabled) or not. This allows you to choose who the Parent of the page is. The drop-down menu shows all the Pages on your site. If you don't select one, it will be a top-level page. If you want it to appear under one of the top-level pages or a sub-page, select that top-level page or sub-page from the list. When it is displayed, you will know that there is a sub-level page as there will be a small down-arrow symbol on the tab. 8. 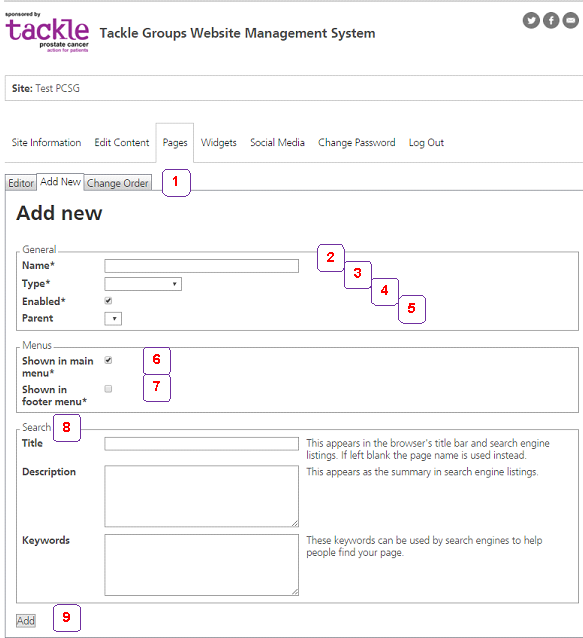 The Search fields allow you to control what search engines (eg Google) will index for you. This is an advanced section and a tutorial will be added as soon as possible. It is suggested that you do not key anything in these fields. 9. Clicking the Add button adds the page. Important! ©2019 Tackle is the working name of The National Federation of Prostate Cancer Support Groups Registered Charity No: 1163152.